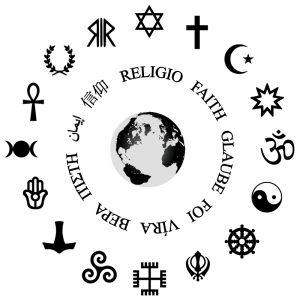 Please find below a number of websites and references to various religions. If you find that a link is bad, please let the Reference staff know. These resources are scholarly, many are from university research centers, and all should be considered reputable sources. Bible Gateway – allows searching of the Bible in various English translations and in more than 25 languages. Blue Letter Bible – “A King James Version Bible with over one million links to lexicons, concordances, conservative Christian commentaries, and six searchable Bible Dictionaries.” Offers Hebrew and Greek lexical resources. Wabash Center for Teaching and Learning in Theology and Religion Guide to Internet Resources – selective, annotated guide to a wide variety of electronic resources of interest to those who are involved in the study and practice of religion. Association of Religious Data Archives – internet-based archive established to democratize access to the best data in religion. Includes teaching tools, congregational resource center, and research resources. Congregational Resource Guide – This guide offers resource recommendations chosen to address the needs of congregations and their leaders. The CRG draws on the expertise of the Alban Institute, the Indianapolis Center for Congregations, and other specialists. Hosted by the Alban Institute; offered as a gift by Lilly Endowment Inc.
Google Full-Text Theological Journals Search. Documenta Catholica Omnia – This resource contains links to various mostly medieval and early Catholic documents. In Latin. buddhanet – Buddhist education and information network, through the Buddha Dharma Education Association. Tibetan and Himalayan Library – “publisher of websites, information services, and networking facilities relating to the Tibetan plateau and southern Himalayan regions. THL promotes the integration of knowledge and community across the divides of academic disciplines, the historical and the contemporary, the religious and the secular, the global and the local. In addition to more typical academic projects, THL promotes participatory knowledge that is created by and benefits local communities, while including contributors from all walks of life around the world. Data includes text, audio-video, images, maps, immersive objects, reference works, and interpretative essays.” Developed in part through the University of Virginia.